Give Online WeShare online giving helps parishioners support the important work we are called to do together. Set up one-time or recurring donations, choose when and how to give to specific collections, and view your complete, accurate financial records at any time during the year. 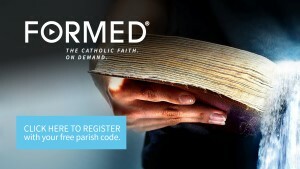 Have you signed up yet for FORMED? Download the free iOS or Android app to put FORMED at your fingertips. Sign up for FREE at https://sienachurch.formed.org. Use Chrome or Firefox or Safari; Internet Explorer won't work. SMART PHONE USERS now have a free App at SCOSNJ.Catholic.Cloud. Announcements, calendar, Mass schedules, and news items. The Legion of Mary Pilgrim Statue is available to visit homes in our Parish Community. If interested, call 732-616-3127 or email pheathers7@yahoo.com. Walking with Purpose is a weekly Bible study program for women. Two programs run simultaneously through Tuesday, May 28 (except April 16 & 23) from 10:00 - 11:30 am. All women of the parish are welcome to join in at any time. For further information, call the parish office at 732-938-5375 or email wwp@sienachurch.org. Anyone over age 12 can be an usher. Confirmation students - earn service hours. Contact the Parish Office at frontoffice@sienachurch.org or 732-938-5375. The Diocese of Trenton is committed to the initiatives outlined in the U.S. Bishops Charter for the Protection of Children and Young People... See the remainder of the Notice from the Diocese. Check out Links for a wide variety of information of interest to Catholics.